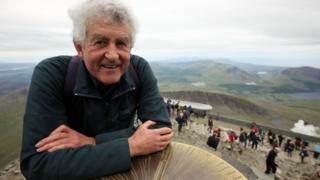 Rhodri Morgan stabilised Welsh devolution after its rocky first year, and spent nine years as first minister in his own idiosyncratic style. At a time when soundbites were the norm, he spoke like no other politician - his response to being asked whether he wanted to lead the yet-to-be-created assembly was "do one-legged ducks swim in a circle"? In office he pursued a strategy of differentiating his administration from Tony Blair's New Labour government, using the new devolved powers to opt-out from Blairite reforms to health and education. It was called "clear red water", but in true Morgan style he never uttered the phrase, leaving it out of a key speech in order, he later suggested, to save time. Born in Cardiff just after the outbreak of war in September 1939, Hywel Rhodri Morgan was educated at Whitchurch Grammar School, Oxford and Harvard University. He worked for South Glamorgan Council before becoming head of the European Community's office in Wales in 1980. In 1987 he was elected as the MP for Cardiff West, serving in various front-bench roles until Labour won the 1997 election, when he took on the chairmanship of the Public Administration Select Committee. He yearned to take the helm in the new assembly created by the 1997 referendum, but lost two leadership elections, one to Ron Davies, and a second, in bitterly contested circumstances, to Alun Michael. But within nine months of the first devolved elections in May 1999, Mr Michael was out, unable to free himself from the thickets of a row over EU funding. Mr Morgan took over in February 2000. By the autumn he had formed a coalition with the Liberal Democrats, showing a pragmatism that lay behind the rhetorical flourishes - it was to the fore again in 2007 when he formed another coalition with Plaid Cymru, despite the horror of some in Labour at the thought of any dealings with nationalists. Those talks - prompted by Labour losses in the 2007 Assembly elections - proved stressful; in July he was admitted to hospital where he underwent heart surgery. He recovered, changing his diet and telling friends he felt a decade younger. He had already announced his retirement date of 2009, and in December 2009 he handed over the reins to Carwyn Jones. In 2008 he told BBC Radio Wales of his wish to spend his final day on earth swimming with dolphins at his beloved Mwnt in West Wales, scene of annual family holidays. He is survived by his wife, Julie, and two daughters and a son.